#2 1/2 Alto Sax Reeds. The Rico three pack is a perfect quantity for students who need to have a spare reed or two without having to commit to purchasing 10 reeds. Each reed in the three pack is individually packaged in Rico's patented plastic reed holder to protect it from breakage and warping. Three packs are available for Bb clarinet, alto, tenor and bari saxophones. We stock #2, #2 1/2 and #3 strengths for all but the bari sax, which are offered in #2 1/2 and #3 only. 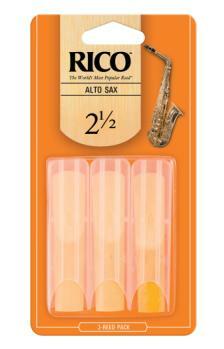 Rico reeds are the perfect value reed for the beginning student. The strength of the reed refers to the thickness. Students typically start on 2 or 2 1/2 and move up as they become better players. Thicker reeds will produce a better tone but are more difficult to play for the beginner.